Happy 4th of July everyone and we wish you a safe, healthy and fun-filled Independence Day. We also wish our Canadian friends a very Happy Birthday on their special day, Canada Day, July 1st. For those of you who are traveling from all over the world and all over the country to meet us in Madison, WI for Wing Ding 36, we can't wait to meet you or see you again. It is going to be a great show with many new events and special times. I can't wait to see old and new friends, so make sure you look me up when you get there. Below you will read a major announcement from our President, Abel Gallardo, about a new event. I am very excited about this event and the location. Please read Abel's article and know that this location has some of the best riding and most beautiful attractions in our country! It will be a very different event than most of us have been used to, so stay tuned in the coming months as we share more and more about all the surprising things we have planned for this western event...and EVERYONE IS INVITED!! Continuing on the events theme, GWRRA's Weekend at the Opry in Nashville, TN at the Opryland Resort is going very well. We are 95% sold out. So, if you have not booked your room, please do so now! Check out the website at opryevent.gwrra.org/ to register and find out all the information about all the activities, like the optional tours, dinner/dance, seminars, meet and greets with GWRRA's VIP's, as well as all the fantastic activities at the Opryland Resort! Remember, registration is only $20 and it includes a free pin and t-shirt. Last month I mentioned how much we should all be appreciative of our Officers and Volunteer staffs. I received a great suggestion after that to run a profile of a current or former Officer each month in Wingin' It and I think that is a great idea. So, what we need are submissions from you, either current or former Officers; to include your history with GWRRA, the positions held, a picture of you and your ride (jpg format preferred), dates, Chapters/Districts/Regions served, and limited to 300-500 words. Please send your submissions to me here. I want to personally thank all the contributors to the July issue of Wingin' It. Thank you to our President, Abel Gallardo, for his great article "We're Coming West" and Ray and Sandi Garris for their article on GWRRA, "What I Borrowed From A Recent Newsletter" My thanks also go out to Joe and Gracie Mazza for their Rider Education articles, Gene Hanselman for his wonderful stories, and Tom Hendricks for his continued supply of great jokes. There is a great article from our Deputy Directors, Bill and Dea Ann Gray, and a wonderful article about "How To Find Friends" by Carl Breeding. Fred Fischer wrote a nice Thank-You letter from Chapter CO-L. And we have an international article from Jurgen Petri, our German District Direct about "Mr. Gold Wing Lives In Germany!" There are also pictures of Mike Romano's Member's Machine below, so take a peek. Remember to send in your pictures of your machine next month so we can feature it! We also have a Member charity ride story from Ken & Connie Jordan, Chapter TX-U and an article about Chapter OH-W, sent in by George Click, who are celebrating 29 years with GWRRA soon. Also, don't forget to read the coupon at the bottom of the Wingin' It to save 25 percent off the GWRRA 10" Logo Crest Patch! "Whether it's the best of times or the worst of times, it's the only time we've got"
The History of GWRRA'S Ohio's Chapter "W"
Association headquartered in Phoenix, Arizona, was chartered on November 2, 1985. Because the Chapter was founded in Wyandot County, the last settlement of the Wyandot Indians in Ohio, we nicknamed our chapter the "Wyandot Wings". since most of the Members reside in Marion. in many local, state and international events. I don't care what you've discovered, Christopher. You could have written. Mike, can't you paint on walls like other children? Do you have any idea how hard it is to get that stuff off the ceiling? All right, Napoleon. If you aren't hiding your report card inside your jacket, then take your hand out of there and prove it. I've got a bill here for a broken chair from the Bear family. Do you know anything about this Goldie? But, Albert, it's your senior picture. Can't you do something about your hair? Styling gel, mousse, something...? Of course I'm proud that you invented the electric light bulb, Thomas. Now turn off that light and get to bed! Would you like to see a GWRRA National Event in the Western United States? I guess I could borrow a saying from another organization and say "To find a friend, be a friend", but what works best for me is to need a friend. It is not just the folks who are in your riding group, but often a complete stranger will go out of their way to take their time to help you when they see you are trying to help yourself. My wife Jan and I had spent the morning working at a Motorist Awareness day at the Alabama Welcome Center on I-65 near Athens, Alabama, then set out with Steve and Shirley Kremer to join the rest of the Chapter on a trip to Key West, Florida. We were a way down the road when Steve let me know a wheel had locked up on my trailer. We changed out the tire and got on to a place where we could get parts and proceeded to attempt to repair the trailer. Once we were at the parts store, Steve and I jacked up the trailer, pulled the wheels, and discovered both sides had the bearings frozen. New ones were purchased, and I naively thought it would be a quick fix, just a simple thing.... HUH. The frames of the wheel bearings had welded themselves to the axel, so we proceeded to heat the part and try to get it to pop off, we even succeeded on one side, and got it repaired and the wheel back on. The other side was a bit more obstinate. We banged, cussed some, heated more, banged more, cussed more, I even tried to saw the wheel bearing frame off of the axle with a hacksaw; two young men drove up and jumped into the middle of what we were trying to do, the difference being they had a cutting torch in the truck with them, and of course the other difference is that they succeeded. Repairs were completed and we tried to compensate them for all of their help, but their attitude was, "Pay it forward". We are not surprised when friends help out with problems, but when a complete stranger takes the time to make a difference in your life, the least you can do is say "Thank You" to Kevin Massey, owner of Massey Mechanical & Systems, Alabaster, Alabama and his friend, Aaron McGuire I say a BIG Thank You! These are the type of folks we should all have the fortune to encounter when we really need a friend. The story ended well, we joined up with the rest of the group in Bonita Springs, Florida, rode across the Everglades, and on to Key West. We saw the "Little White House" used by President Truman, the lighthouse, and several toured Ernest Hemingway's home. A Ghost tour of Key West and a Sunset Cruise were also on the agenda. Jan, Steve, Shirley, and I took a detour on the way back and visited Orlando, and arrived back home after nine days tired, but refreshed. Travel and adventures shared with friends make memories that last a lifetime. Serving the membership of GWRRA is a true passion shared by each and every one of us here in Phoenix. There is no better reward than reading the countless letters and emails regarding how much this Association has done for each and every one of its Members; about the friendships that have been made that are sure to last a lifetime; and about the lasting memories made traveling around this great country, experiencing everything their travels and GWRRA has offered. In recent years, a common theme of these communications has also been a lack of attention to the western part of the United States. A great number of you have expressed that GWRRA has focused much of its attention and activities toward the eastern part of the United States. And as much as that perception may be hard to argue with, I can tell you that it has not been done intentionally and our desire to spread ourselves all over the country is as strong as ever. The more the sentiment kept growing, the more committed my team and I were to look for opportunities to bring events and activities that our western Members would attend and enjoy. Month after month and year after year, we would get close, but for one reason or another, the necessary support could not be found. All that being said, as I write this piece for Wingin' It this month, I am excited to say that our commitment to the West never wavered, and our search for support of these efforts never took a back seat to other activities. Which is why I'm so excited to let each and every one of you know that GWRRA is coming West! That's right, in June 2015, GWRRA will bring a new national event to Reno, NV, which we have titled the Reno Rendezvous. The Reno Rendezvous will be held at the Grand Sierra Resort and Casino convention center, and we could not have been more fortunate to find this location. With all of our other events, it has been difficult to find locations that will create an all-in-one environment, but the Grand Sierra does just that. With enough hotel rooms to host all of our attendees, trade show space to host the countless vendors and exhibitors GWRRA continuously brings to its shows, a 50-lane bowling alley, large entertainment theater/venue, this location will redefine the term "stay and play" for all the attendees that join us at the Reno Rendezvous. The city of Reno is a great destination for entertainment, riding and a true GWRRA event experience. I hope all of our Members will mark their calendars and join us as we kick off what I know will be one of the greatest events we've ever put together. Thanks to John and Linda Boman CA Assistant Directors. Fun Stuff!! 2. If you sit for more than 11 hours a day, there's a 50% chance you'll die within the next 3 years. 3. There are at least 6 people in the world who look exactly like you. There's a 9% chance that you'll meet one of them in your life time. 6. If a part of your body "falls asleep" you can almost always "wake it up" by shaking your head. 7. There are three things the human brain cannot resist noticing - food, attractive people and danger. 16. Our brain uses the same amount of power as a 10-watt light bulb! 17. Our body gives enough heat in 30 minutes to boil 1.5 liters of water! 18. The Ovum egg is the largest cell and the sperm is the smallest cell! 19. Stomach acid (HCI) is strong enough to dissolve razor blades! 22. Eat more foods that grow on trees and plants and eat less food that is manufactured in plants. 23. Drink green tea and plenty of water. Eat blueberries, broccoli and almonds. 24. Try to make at least three people smile each day. 25. Eat breakfast like a king, lunch like a prince and dinner like a college kid with a maxed out charge card. 26. Life isn't fair, but it is still good. 27. Life is too short to waste time hating anyone. Forgive them for everything. 28. Don't take yourself so seriously. No one else does. 29. You don't have to win every argument. Agree to disagree. 30. Make peace with your past so it won't spoil the present. 31. Don't compare your life to others. You have no idea what their journey is all about. 32. No one is in charge of your happiness except you. 33. Frame every so-called disaster with these words: "In five years, will this matter?" 34. Help the needy, be generous! Be a "giver" not a "taker". 35. What others think of you is none of your business. 37. However good or bad a situation is: it will change. 38. Your job won't take care of you when you are sick. Your friends will. Stay in touch. 39. Envy is a waste of time. You already have all you need. Just not all you want. 40. Remember that you are too blessed to be stressed. Hope you enjoyed these little known facts, we did. I would like to take the time to recognize a few of the Motorist Awareness Coordinators in our Association. They come from all across the country and have been outstanding in helping to get the message of sharing the road to the motoring public. These people have worked tirelessly for our program. Wayne and Elva are the Region N (North Carolina, Virginia Tennessee, Kentucky, West Virginia) Motorist Awareness Coordinators. They have received recognition awards before, including being named MA Coordinators of the Year in 2009. It is their leadership skills that have made Region N tops in the organization for MA activities year after year. They recently received a funding grant for highway electric message boards throughout the region. Region N has partnered with Wal-Mart to distribute MA material in 36 region stores. They have also been responsible for a number of radio and television interviews. They will once again be receiving recognition at our Wing Ding Rally/Convention this year. In the one year that Mike and Barri have been Region F (California, Arizona, Colorado, New Mexico, Nevada, Utah, Hawaii) MA Coordinators I have received more phone calls from Mike than all the other coordinators combined. I like that very much. It shows an enthusiasm that, hopefully, is contagious throughout his Region. Keeping me appraised of what's happening and asking pertinent questions shows an interest above and beyond. Mike conducted an MA information seminar at the Region F Rally/Convention this year that was very well received. Mike and Barri will be receiving a well earned recognition award in July at Wing Ding. Robert is the Wisconsin Chapter 1-A MA Coordinator and Bill and Mervi are the Wisconsin District MA Coordinators. These three coordinators are responsible for Wisconsin being one of the more progressive districts in our organization. They lead all districts in high school driver education MA presentations. This means they have often contacted local boards of education and school administrators asking for permission to present our program to beginning drivers. This was the main goal of our program this past year and Wisconsin led the way in that respect. Bill and Mervi have been recognized in the past including MA Coordinators of the Year. Robert will be recognized this year for his outstanding work. How fortunate we are in rider education to have such dedication. A big Thank You goes out to these wonderful Members and to so many others who work hard to make our program the success it is. We are so honored to win the award of 2013 International Chapter Of the Year. It all started late in the year, 2012. At a Chapter Game Night, I made the bold statement that I wanted Chapter L to be the 2013 International Chapter Of the Year. I asked if any were interested in making that happen. With a more than positive response, we were off. In early January, Chapter Of the Year Coordinator, Carl Williams presented that Chapter "What it would take to win". Chapter Members agreed the goal was achievable, and in early February, Carl laid out the plan of attack. One of the biggest huddles we had here in Colorado is dirt. Not the kind we grow crops in, but the distance we have to travel to visit other Districts and Regions. The closest District Convention, other than our own, was 280 miles away. The nearest Region Convention, 515 miles away. During the year, our Chapter Members traveled a total of over 36,000 accumulative miles to visit 9 conventions. We also spent over 800 hours in training classes. Most importantly, we had fun. As we traveled the miles and gathered for all the events we enjoyed each others company. We laughed, joked, and just had a good time. We even had a wedding as one of our Chapter extraordinary events as one of our Members got married. Another one of our Members became an Ordained Minister so he could perform the ceremony. This would not have been successful without the hard work of ALL of the Chapter Members. I want to say a special thank you to our coordinator, Carl Williams. Carl spent many hours scheduling events, gathering information, and documenting all of the points. I am your constant companion. I am your greatest helper or heaviest burden. I will push you onward or drag you down to failure. I am completely at your command. Half the things you do might as well be turned over to me and I will be able to do them quickly and correctly. I am easily managed - you must merely be firm with me. Show me exactly how you want something done and, after a few lessons, I will do it automatically. I am a servant of all great people and, alas, of all failures as well. Those who are great, I have made great. Those who are failures, I have made failures. I am not a machine, though I work with the precision of a machine plus the intelligence of a person. You may run me for profit or run me for ruin - it makes no difference to me. Take me, train me, be firm with me, and I will place the world at your feet. Be easy with me and I will destroy you. Who am I? I am a habit! How do habits control our lives? A habit is defined as a regularly repeated behavior pattern: an action or pattern of behavior that is repeated so often that it becomes typical of somebody, although he or she may be unaware of it. As we age, and I'm only speaking from experience, our brains tend to run on cruise control much of the day and taking the path of least resistance is the norm. Tomorrow, try something...sleep on the other side of the bed, brush your teeth with the other hand, take a different route to work or the store. Here is a REAL challenge...turn the toilet tissue the other direction!! Yes, these are all habits we get so used to that tend to keep us on auto pilot! What habits have we fallen into with GWRRA? At gatherings, do you park in the same place? Do you tend to sit at the same table? Do you try to sit with the same friends? Do you sometimes eat the same things? Is the meeting agenda the "same ole, same ole" each month? These are all habits! Our brains have been trained to follow the same paths day in and day out and without thinking we never try something new! appealing, attractive and fresh, we need to train our brains and bodies to stay active and think "outside the box!" My challenge to every Member; change your habits (especially the bad ones,) and do something different today, tomorrow and every day that will impact you, your loved ones and your friends in a positive way. Oh, and one other thing, always have a smile on your face...make others wonder what you've been up to! See you down the road (but not the same road)! Breaking News: Mr. Gold Wing lives in Germany ! Nearly everbody knows that Donald Duck lives in Duckburg (German: Entenhausen). Nobody questions that Santa Claus resides at the north pole, Superman (Clark Kent) stays in Smallville and Batman (Bruce Wayne) is a citizen of Gotham City. But where does the incredible Mr. Gold Wing live? Ever thought about that mystery? Since a few month the secret is disclosed. Mr. Gold Wing answers to the name of Joachim Schmidt. He lives in Germany and he is a proud Member of GWRRA and the District Germany with its Chapter GE-B Colonia. He is a very experienced Gold Wing rider and is able to handle his Gold Wing perfectly under all conditions. How can the statement in the headline be proofed you might ask? Please have a look at the license plate of Mr. Gold Wing's wonderful GL 1500 SE. It shows GL SE 1500. It is not a fake! In Germany the license plate is an official document and it is clearly defined how it must look like. The license plate must show an abbreviation of your hometown followed by one or two randomly assigned letters and a randomly assigned three or four digit number. Within limits you can ask for personalized letters and numbers. But you are not able to change the abbreviation regarding the letters of your hometown or area. So you can imagine the unlikelihood to get such a matching license plate number and that nobody else had got it earlier in previous years and therefore could have blocked it for decades. As one secret of the Gold Wing scene is disclosed know the focus goes to the other secret: Who is behind GL SE 1800? We all know the meaning of the word "Trike". When it comes to a motorcycle trike, there are many different meanings. Motorcycle trikes may have one wheel in front and two behind or two wheels in front and one behind. They may have two in line and one off set, ie: motorcycle with a sidecar. Most are steered with handlebars but some use steering wheels. Trikes have been made from car foundations, notably ones with VW engines, and they have been made from Vespa scooters and nearly any other car, motorcycle or fabricated frame out there. Trikes are not new, they date back a century. Three-wheeled motorcycles have played various roles throughout American history. In the 1910s, Harley-Davidson made sidecars for American troops fighting in WWI. In 1932, the Milwaukee-based company introduced the three-wheeled 45 c.i. Servi-Car, which became popular with the police and delivery businesses, but was discontinued in 1972. Many chopper builders used the frame to make the early trikes by turning the axle upside down so the 61 & 74 c.i. power plants could be used. In the 70s a friend, Gary Simpson, built such a machine. A 1960 FL, H-D Panhead with a 1940 Servi-Car rear end. The frame was from a 1939 OHV bike with extended Columbus Custom Springer, trick paint, reverse chrome wheels and L60 X 15 tires. A real cool righteous ride. In the years that followed, a lack of trikes in the marketplace gave rise to conversion businesses that modified motorcycles with an extra wheel. Recognizing the rising demand for trikes and the fact that motorcycle riders are aging, many new trike builders entered the arena. At this time there are over 15 different trike manufacturers for "conversions", plus another three "Reverse" chassis with engines, as Can-Am. There are over 10 "ground up", brands that make up choppers and a variety of other chassis. The consumer also has four "convertible" models which bolts on and off in short time so the rider can have the best of both worlds. A few years ago Harley started making its own popular version from the Tour Glide. The TriGlide comes complete with cruise, reverse, GPS, stereo, hand warmers and headsets for $30,000. Harley won't publish how many trikes it has sold, but its CMO noted that 23% of trike owners are women. He also stated that they cannot keep up with demand. Honda does not make its own trike because of the old 3-wheeler ATVs that would tend to tip over and caused law suites. These new trike conversions have many advantages over the old ATVs and motorcycles in general. With a longer wheelbase and wide tires that provide ease of maneuverability, traction and comfort, a trike remains stable under all conditions encountered on the road. In addition, there is no need to put your feet down when you stop, and you can carry a passenger without the fear that you may tip over. 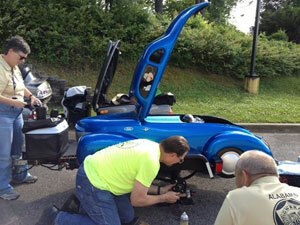 Trikes allow riders with arthritis, back pain and other physical ailments to go on long distance rides comfortably. For us older riders, it's better on three wheels than two. jobs can give trikes that personal touch. I have a friend that invested over $45,000 in his Gold Wing trike and trailer. There are a number of trike organizations to fulfill everyone's wants and needs. Check the Internet for an organization best suited for you. Manufacturers are helping to train individuals to ride trikes. Honda GWRRA has recently included a trike coarse for beginners and experienced riders. In 1999 I built my first of three, a 1500 GL with a 2000 Motor Trike kit. "Keep On Triking." Here are some Members' comments we received from last months Wingin' It on the subject of "Darksiders" and using a car tire on the rear of a Gold Wing and GWRRA's 37th anniversary! Please remember, GWRRA nor Wingin' It enews does not endorse this concept. We are merely presenting information from our Members as a point of conversation. Thank you for your kind words about my article in last month's Wingin' It. Your wish is granted! Updates concerning our change in tire(s) will be provided from time to time. I will also be happy to answer the questions you asked along with any questions that may arise in the future. I changed the tire, which wasn't easy due to a lack of equipment. Next time I plan to take the tire and wheel to an independent bike shop and tell them it is a spare for a trike. Since they will not see a motorcycle there shouldn't be an issue with liability. The kind of tire used makes no difference when it comes to balancing. (Since we have Centramatic wheel balancers front & rear it was not necessary to balance our tire). Best I can tell the road noise is slightly less than the E3 we used to have and speedometer accuracy went from 5% over actual to 4% over. One posting I recall reading discussed a tire one size larger than ours. Supposedly their speedometer is now very accurate. The tire we chose for our Wing was not available in that size and since majority of the posts I've read referred to use of a size 195/55-16 this is what we went with. Lyn and I will be 2 up and towing our Bushtec to Lake George for Americade in June, then in September we head for Niagara Falls prior to attending a rally in the Finger Lakes Region of New York State. The ride to the Falls will be the longest day of riding Lyn has ever undertaken. After each of these I will submit a write up to Wingin' It. This change, in addition to the full package of Traxxion steering and suspension components and a Russell Cycle Products seat, has made our Wing far more comfortable to ride then it was new. This experience is new to me and I am not an expert on the subject. I commend you for taking the time to carefully consider such an important decision and recommend you continue to study what others have posted in online forums. My thanks go out to the many who have posted, especially on the GL1800 Riders Forum where much of my information comes from. On a final note, I earlier used the word "tire(s)". When our front tire is ready for replacement it is likely we will be going with a Bridgestone rear tire that fits the front wheel of the GL1800 and many users have written highly of. 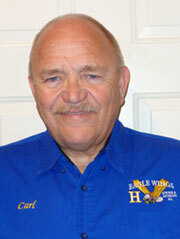 Bill McIlrath--Life Member, GWRRA & The American Motorcyclist Association--Former Contributing Writer, Wing World magazine--Darksider #1550. Saturday, June 7, 2014 was a fun and "surprising" day for Members of Chapter U in San Antonio, Texas. The day just proved that almost everyone loves and enjoys motorcycling. We were contacted by the Silver Tree Nursing and Rehabilitation Center located in Schertz, Texas and asked if we could again come visit and show off our bikes and trikes to the residents. This was our second trip to the facility over two years. Our first was in 2013 when we visited for Father's Day. The residents were very excited to see such beautiful two and three-wheel "motor vehicles". Several men were given rides on the bikes and trikes on a trip around the complex a couple of times. Today, we had five trikes volunteer for our trip to Silver Tree. Residents met us out front and inspected the trikes while asking various questions. Many comparisons were made to the motorcycles they had ridden in years past. We offered rides and several men took us up on the offer. But then, to our surprise, several women asked to ride. The residents' ages varied between 65 years and 93 years of age. One of the first women to "jump" onto a trike was a 93 year old woman who was not quite ready to stop riding when the time came. This was an ice breaker because then other women from the audience were ready to take their turns. Chapter Members helped transfer those who wanted to ride from their wheelchairs onto the trike seat and back to their wheelchair when the ride ended. It was very satisfying and such a pleasure to see everyone having so much fun. When we left, everyone had big smiles on their faces, including the Members of Chapter U. Our Chapter is such a great bunch of people-always willing to go the extra mile and accept any surprises that may come our way. 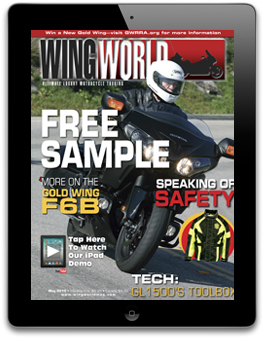 Wing Ding -- Attend the world's largest Gold Wing motorcycle rally and trade show. Held annually, Wing Ding is the only major American motorcycle event to change locations each year, bringing the largest Gold Wing and Valkyrie vendor show, grand parade, rider education, entertainment and seminars to different and exciting, air-conditioned venues every summer. Visit www.wing-ding.org. Liberty Mutual Auto & Home Insurance: Your member benefits include a special discounted rate on Auto Insurance and Home Insurance from Liberty Mutual. We're proud to provide our members with a great benefit from a Fortune 100 company that protects millions of people across America. Find out more about Liberty Mutual Home & Auto Insurance at www.libertymutual.com/gwrra or call 1-800-524-9400 and mention client #117743. 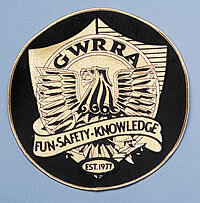 Get the New GWRRA 10" Logo Crest Patch black/gold. Your vest or jacket will shine with this new patch. You can put this on the back of your vest/jacket and show off your GWRRA.